Put on your gun-heeled boots, adjust your halos, and get ready for the long-anticipated sequel to one of Japan’s best-selling art books, The Eyes of Bayonetta 2. Translated into English and available for the very first time in the North American market, The Eyes of Bayonetta 2 is here just in time for the holidays. Originally released by Platinum Games as a Nintendo exclusive title, Bayonetta 2’s titular heroine is a havoc-wreaking witch whose aim is just as impressive as her style, all of which is on display in this gorgeous 208 page hardcover book. The Eyes of Bayonetta 2 collects all of the artwork behind this celebrated video game sequel into a perfect companion to the video game series. From Fimbulventr to the Gates of Hell, The Eyes of Bayonetta 2 explores developmental sketches, weapon and environment designs, as well as promotional artwork, journal entries, and plenty of exclusive creator commentary throughout the pages. 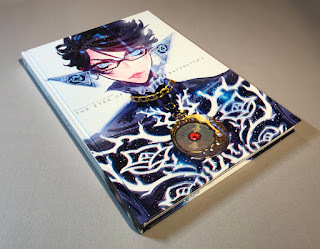 Series artist and character designer Mari Shimazaki, also known for her work on Okami, Soul Calibur V and Tekken 7, is featured prominently in this book as her incredibly detailed character designs have infused Bayonetta with an iconic style that is instantly recognizable. The Eyes of Bayonetta 2 is now available for pre-order and will be released on November 20, 2018. Bring this legendary title home for the holidays!